We’d love your help. 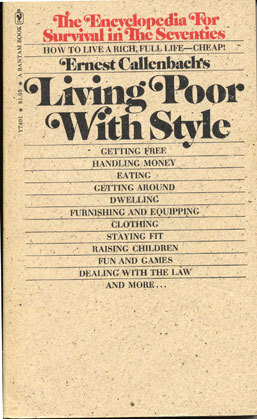 Let us know what’s wrong with this preview of Living Poor with Style by Ernest Callenbach. This fun and practical guide offers a huge variety of tips on living for less "with grace, humor, (and) imagination." The author covers a wide range of topics including food, housing, transportation, clothes, and entertainment. To ask other readers questions about Living Poor with Style, please sign up. This is a great book! It has everything one needs to think about when striving to live frugally all wrapped up in one well-written and pleasingly designed package. However, the 1992 edition which I read is somewhat quaintly antiquated -- no discussion of the internet, or freecycle, or craigslist. Nevertheless, the principles remain sound -- we just don't have to depend on bulletin boards in laundromats anymore. This is a great place for the aspiring frugilista to begin or an excellent summary for This is a great book! It has everything one needs to think about when striving to live frugally all wrapped up in one well-written and pleasingly designed package. The name of this book just popped into my mind and curious to see if it was still available, I found it is. My husband and I were struggling financially when this book came out in 1972, a couple years after we married. I remember how it encouraged us and how we benefited from its advice. If I recall correctly, it was written with good humor and practical hints. I am informed that although some it is comically outdated, still the general advice and tone of the book remains as good as ever it was. A bit outdated, but still useful with money saving ideas. Wenn ich das Buch schon früher gehabt hätte, hätte ich mir einiges an Ärger erspart. Im wahrsten Sinne des Wortes. Es ist wie die Zusammenfassung aller Weisheiten, die Großmutter und Großvater schon immer ihren Enkerln mit auf den Weg geben wollten. Eine erfrischende Anleitung, um besser, glücklicher und gesünder zu leben - mit vielen Tipps und Tricks leichter und vorallem nachhaltiger durch den Alltag zu kommen. Von wie kauft man ein, hält die Küche sauber und was muss man beim Autokauf beachten Wenn ich das Buch schon früher gehabt hätte, hätte ich mir einiges an Ärger erspart. Im wahrsten Sinne des Wortes. Es ist wie die Zusammenfassung aller Weisheiten, die Großmutter und Großvater schon immer ihren Enkerln mit auf den Weg geben wollten. Eine erfrischende Anleitung, um besser, glücklicher und gesünder zu leben - mit vielen Tipps und Tricks leichter und vorallem nachhaltiger durch den Alltag zu kommen. Von wie kauft man ein, hält die Küche sauber und was muss man beim Autokauf beachten, bis zu warum wäre es besser mit dem Rad zu fahren. 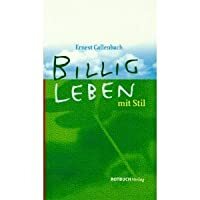 Das Buch hilft wirklich jeden Lebensbereich qualitativer zu gestalten! Now that some fell beast slouches proudly again toward Wall Street, this book could come in mighty handily. For those who like (and deserve to be) living the good life but are turning down at the pocket.Sure prices have jumped in the years intervening its publication, inflation and all, but the advice with in is as good as gold. Now I just need to hook myself up with a new copy! Highly recommended. This has a few interesting ideas about saving money, but it's mostly stuff you already know.